Yvette Cuthbert is a strong believer in the strengths of creativity in all aspects of life, looking at things differently is a skill everyone should develop in this fast changing world. Yvette has her degree in Interior design, and while studying learned about perspective and how to make presentations using watercolour and markers. She also worked for a newspaper for some time creating ads and layouts. Yvette loves public art, and believes it makes such a difference to the urban landscape, personalizes it, as well as making people think, or at least smile. She believes Collaborative Community Art is a wonderful tool to break barriers and build bridges. She has created murals, signs for the entrance to the city she lives in, and free form concrete structures for parks. She was also the chair of the Artsmarts committee for sometime and encouraged public art projects with students in the community. 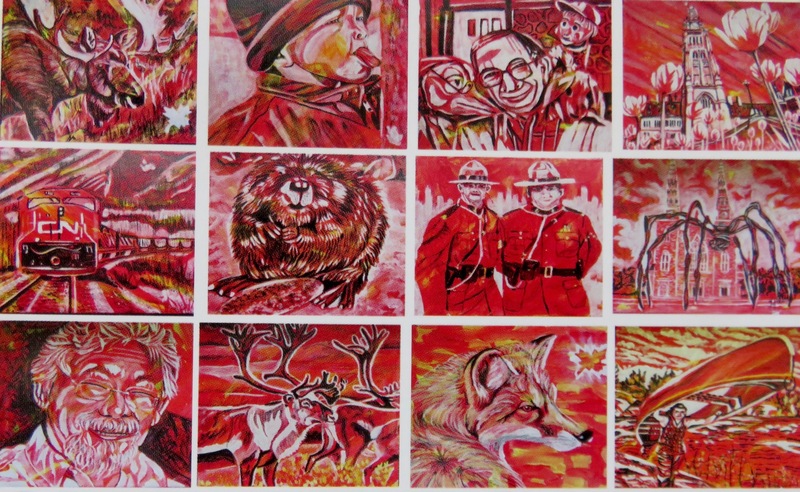 This year for Canada’s 150th birthday, she gave herself a personal challenge to create 150 paintings about Canada in predominantly red and white, some including a maple leaf. Such a wide variety of subjects to choose from! Yvette even learned somethings about Canada she didn’t previously know about, like they used camels during the Gold Rush, and Flin Flon has sewer boxes, since homes are built on solid rock. People that have seen her exhibit are often found chuckling, at images that they recall from their childhood, like having your tongue stuck to a metal pole in freezing temperature, or “Mr. Dress Up”, or the “Red Green show”. Some of come to her afterwards thanking her her for creating such a grouping of images from Canadian life. Because of Yvette’s interest in public art, she is curious about graffiti artists like “Banksy” who uses stencils and their public display to open eyes to concerns, a social activist. The series she calls “Celebrate Canada”, are all made using a stencil for the white/highlight areas, a background of red to yellow and black is used after the stencilling with white. She hopes to use stencils to create public art around Portage la Prairie with positive messages and some selfie opportunities.